disodium edetate, sodium hydroxide and water for injection. The viscosity of pulmonary mucous secretions depends on the concentrations of mucoprotein and, to a lesser extent, deoxyribonucleic acid (DNA). The latter increases with increasing purulence owing to the presence of cellular debris. The mucolytic action of acetylcysteine is related to the sulfhydryl group in the molecule. This group probably ``opensâ€²â€² disulfide linkages in mucus thereby lowering the viscosity. The mucolytic activity of acetylcysteine is unaltered by the presence of DNA, and increases with increasing pH. Significant mucolysis occurs between pH 7 and 9. After proper administration of acetylcysteine, an increased volume of liquified bronchial secretions may occur. When cough is inadequate, the open airway must be maintained open by mechanical suction if necessary. When there is a mechanical block due to foreign body or local accumulation, the airway should be cleared by endotracheal aspiration, with or without bronchoscopy. Asthmatics under treatment with acetylcysteine should be watched carefully. Most patients with bronchospasm are quickly relieved by the use of a bronchodilator given by nebulization. If bronchospasm progresses, the medication should be discontinued immediately. With the administration of acetylcysteine, the patient may initially observe a slight disagreeable odor that is soon not noticeable. With a face mask there may be stickiness on the face after nebulization. This is easily removed by washing with water. Under certain conditions, a color change may occur in the opened bottle of acetylcysteine. The light purple color is the result of a chemical reaction which does not significantly affect the safety or mucolytic effectiveness of acetylcysteine. When three fourths of the initial volume of acetylcysteine solution has been nebulized, a quantity of Sterile Water for Injection, USP (approximately equal to the volume of solution remaining) should be added to the nebulizer. This obviates any concentration of the agent in the residual solvent remaining after prolonged nebulization. 6. Entries are final concentrations. Values in parentheses relate volumes of acetylcysteine solutions to volume of test solutions. • The stomach should be emptied promptly by lavage or by inducing emesis with syrup of ipecac. Syrup of ipecac should be given in a dose of 15 mL for children up to age 12 and 30 mL for adolescents and adults followed immediately by drinking copious amounts of water. The dose should be repeated if emesis does not occur in 20 minutes. • In the case of a mixed drug overdose activated charcoal may be indicated. However, if activated charcoal has been administered, lavage before administering acetylcysteine treatment. Activated charcoal adsorbs acetylcysteine in vitro and may do so in patients and thereby may reduce its effectiveness. • Draw blood for predetoxification acetaminophen plasma assay and baseline SGOT, SGPT, bilirubin, prothrombin time, creatinine, BUN, blood sugar and electrolytes. • Administer the loading dose of acetylcysteine, 140 mg per kg of body weight. (Prepare acetylcysteine for oral administration as described in the Dosage Guide and Preparation table). • Determine subsequent action based on predetoxification plasma acetaminophen information. Choose ONE of the following four courses of therapy. A. • If the patient vomits an oral dose within 1 hour of administration, repeat that dose. • In the occasional instances where the patient is persistently unable to retain the orally administered acetylcysteine, the antidote may be administered by duodenal intubation. • Repeat SGOT, SGPT, bilirubin, prothrombin time, creatinine, BUN, blood sugar and electrolytes daily if the acetaminophen plasma level is in the potentially toxic range as discussed below. • If the predetoxification plasma level is above the broken line continue with maintenance doses of acetylcysteine. It is better to err on the safe side and thus the broken line is placed 25% below the solid line which defines possible toxicity. 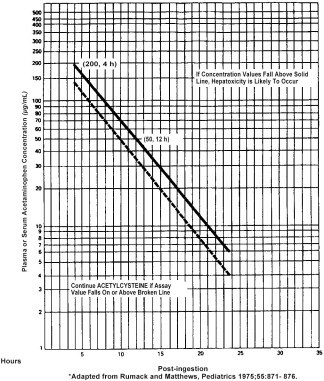 • If the predetoxification plasma level is below the broken line described above, there is minimal risk of hepatic toxicity and acetylcysteine treatment can be discontinued. • Blair D, Rumack, BH, Clin Chem, 1977; 23(4):743-745. • Glynn JP. Kendal SE, Lancet 1975; 1(May 17):1147-1148. Supportive Treatment of Acetaminophen Overdose 1. • Maintain fluid and electrolyte balance based on clinical evaluation of state of hydration and serum electrolytes. • Treat as necessary for hypoglycemia. • Administer vitamin K 1 if prothrombin time ratio exceeds 1.5 or fresh frozen plasma if the prothrombin time ratio exceeds 3.0. • Diuretics and forced diuresis should be avoided. **If patient weighs less than 20 kg (usually patients younger than 6 years), calculate the dose of acetylcysteine. Each mL of 20% acetylcysteine solution contains 200 mg of acetylcysteine. The loading dose is 140 mg per kilogram of body weight. The maintenance dose is 70 mg/kg. Three (3) mL of diluent are added to each mL of 20% acetylcysteine solution. Do not decrease the proportion of diluent. Acetylcysteine solution does not contain an antimicrobial agent, and care must be taken to minimize contamination of the sterile solution. Dilutions of acetylcysteine should be used freshly prepared and utilized within one hour. If only a portion of the solution in a vial is used, store the remaining undiluted portion in a refrigerator and use within 96 hours. A change in color may occur after opening. This does not change the efficacy of the drug. • Bonanomi L, Gazzaniga A. Toxicological, pharmacokinetic and metabolic studies on acetylcysteine. Eur J Respir Dis, 1981; 61 (Suppl III): 45-51. • Am Rev Respir Dis, 1960; 82:627-639.